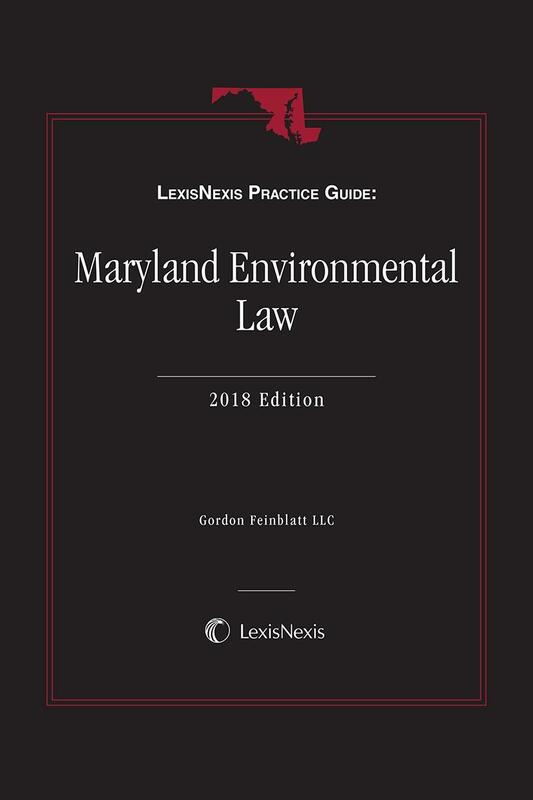 LexisNexis Practice Guide: Maryland Environmental Law is a valuable primer for those Maryland practitioners new to environmental law, as well as a resource for those seasoned professionals that have been working on environmental issues for decades whether as real estate attorneys, land use attorneys, developers' attorneys, corporate attorneys, or utility attorneys. 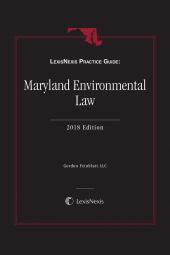 It includes an overview of the scope of Maryland environmental regulation, practical practice perspectives, and specific discussion of particular types of environmental regulations. LexisNexis Practice Guide: Maryland Environmental Law provides a handy reference to both Maryland’s environmental laws and the state's regulatory obligation to comply with applicable federal laws. Written by the environmental practice group at Gordon Feinblatt LLC, the guide is designed to address regulatory provisions related to programs overseen by the Maryland Department of the Environment and the Maryland Department of Natural Resources. It examines rule making, permitting and enforcement issues. In addition to discussion of the specific laws and regulations and their implementation, the guide includes over 250 practice tips (strategic points, timing, warnings and exceptions). Margaret M. Witherup, Primary Author. Ms. Witherup is a member of Gordon Feinblatt LLC in the Firm’s Environmental & Energy Practice Group. She concentrates her practice in all aspects of environmental and administrative law, litigation and government relations. Ms. Witherup has helped business and property owners, real estate developers, farmers, and environmental consultants find practical solutions to ordinary and complex environmental problems through negotiated settlements and/or litigation with responsible parties, governmental entities, and regulatory agencies. She has counseled landowners, prospective purchasers and potentially responsible parties regarding environmental site assessments, voluntary and government-ordered site remediation, brownfields redevelopment, water allocation and appropriation issues, and Superfund sites. Ms. Witherup also has assisted clients with a variety of environmental compliance and enforcement issues, including Notices of Violation, air emissions and permitting, water appropriation and discharge permits, waste disposal, endangered species, stormwater management, Chesapeake Bay Critical Areas issues, and Certificates of Public Convenience and Necessity (CPCNs) for renewable energy facilities. Ms. Witherup has represented clients as both plaintiffs and defendants in environmental contamination liability litigation. Ms. Witherup served as Chair of the Maryland State Bar Association Environmental Section from 2014-2015 and is a frequent lecturer on a variety of environmental topics. Ms. Witherup was recognized as one of Maryland’s Top 100 Women in 2008 and 2011 and received the “Leadership in Law” award in 2014 based in part on her founding and leadership of Subcommittee of Women Environmental Litigators within the Environmental Litigation Committee of the American Bar Association. Michael C. Powell, Contributing Author. Mr. Powell is the Managing Member of Gordon Feinblatt LLC and a member of the Firm’s Environmental and Energy Team. Mr. Powell was named Maryland “Lawyer of the Year” three times (2015, 2016 and 2017) for Environmental Law and Environmental Litigation. In addition, for over two decades, Mr. Powell has been named one of the Best Lawyers in America according to a national poll of lawyers. He has also been named a Maryland “Super Lawyer.” Mr. Powell was a founding member and the first elected chairman of the Environmental Section of the Maryland State Bar Association. Mr. Powell’s environmental work has included defending companies from governmental and third party environmental claims, providing advice on climate change regulations and legislation, negotiating remediation agreements (including Brownfields applications) on contaminated properties, advising companies of climate change developments and negotiating the terms of environmental permits. Before joining Gordon Feinblatt, Mr. Powell served as Principal Counsel to the Maryland Department of the Environment (the chief environmental attorney for the State and the principal advisor to the Attorney General on environmental issues). He also previously served as an Assistant Attorney General advising the State, at various times, on issues involving hazardous wastes, water pollution, solid wastes, radiation control and other environmental and regulatory issues. Mr. Powell has served on the Maryland Climate Change Commission since 2015 and received the Leadership in the Law award in 2009. Todd R. Chason, Contributing Author. Mr. Chason is Chair of Gordon Feinblatt's Environmental and Energy Practice Group. Mr. Chason regularly counsels developers, builders, and other businesses seeking or operating under federal and state permits. He has guided dozens of Brownfields properties through the Maryland Department of the Environment's Voluntary Cleanup Program, ranging from small parcels with dry cleaning issues to golf courses to large former industrial sites, and variously sized projects in between. Mr. Chason is also experienced in handling natural resources issues, including wetlands, Chesapeake Bay Critical Area, and stormwater management. Mr. Chason has represented property owners and inspectors in lead paint enforcement actions, providing both compliance counseling and negotiating favorable resolutions with the Maryland Department of the Environment. Mr. Chason received the Outstanding Professional Services Award from the Fuel Fund of Maryland for the contribution of legal services in 2011 and has been named a Maryland Rising Star in Energy & Natural Resources Law in Maryland Super Lawyers Magazine each year since 2010. Paul N. De Santis, Chief of Legal & Regulatory Affairs, Baltimore City Department of Public Works. (At the time of writing, Mr. De Santis was Counsel in Gordon Feinblatt’s Environmental and Energy Practice Group). Mr. De Santis is also a former Assistant Attorney General for the Maryland Department of the Environment. David W. Beugelmans, Associate in the Firm's Environmental & Energy Law Practice Group, where he focuses on providing counsel on energy, environmental, and public utility regulatory and policy matters. Immediately before joining Gordon Feinblatt, Mr. Beugelmans was a Policy Advisor for the Maryland Energy Administration. Chastity Threadcraft, Associate in the Firm’s Environmental & Energy Practice Group, where she provides counsel regarding regulatory compliance and navigating the permitting process with the Maryland Public Service Commission, including for solar projects.